A number of former pupils undertook war work in WW1. This information comes from various sources, most notably from the Old Masonic Girls’ Association magazine, Massonica (now Masonica with a single s). However, one case in particular, that of Dorothy Watson, comes from an entirely different source which may suggest that there are other examples of war work that have either gone unrecorded or are recorded in non-central places yet to be discovered. Before looking forward with relish to choosing from the dessert menu, it should be clarified that this particular pud is not some tasty morsel as popular as the Dime Bar Special that is a hit with modern pupils but is actually an acronym: P.U.D.D. Furthermore, it is not even an official acronym but just my shorthand for the Prize for Usefulness in Domestic Duties. From the inception of the School there had been a concern that girls should be skilled in needlework and domestic tasks. The advertisement in 1788 for the Matron asked for someone who was “capable of instructing the Children in Reading, Writing, Housewifery and every necessary use of the Needle.” Presumably the necessary use of the needle did not include fine embroidery but related more to hemming handkerchiefs or darning stockings: prosaic and practical rather than fancy work. 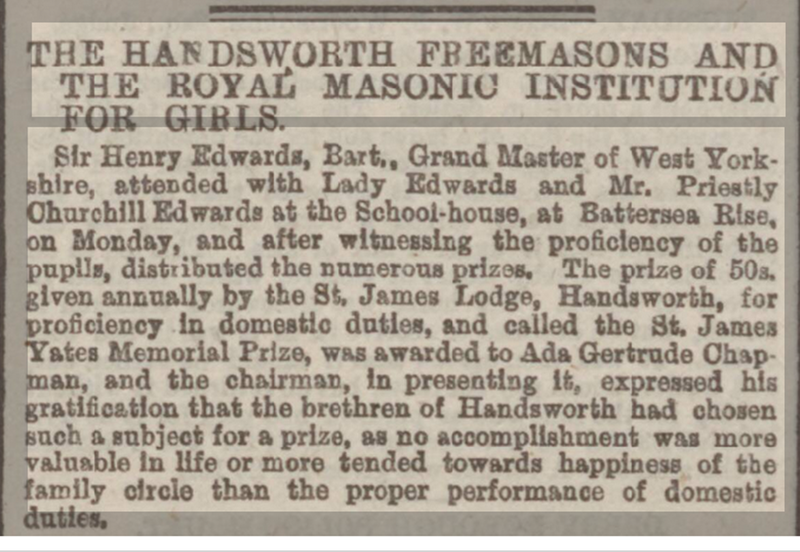 At various times in the School’s history, girls were awarded prizes for domestic skills. The Minute Book for 1834 records the award of a prize for household work and in 1876, we encounter this prize for proficiency in domestic duties with a not insubstantial monetary value. The question is – what exactly is usefulness in domestic duties? As there were prizes for cookery and for needlework given at the same time as P.U.D.D., it must have involved something different. Unfortunately, there appears to be no extant curriculum from this time to know what was taught, assuming that it was a part of lessons. I would be interested in opinions about what this might have included. Is the emphasis on usefulness or domestic or duties? Are there other schools who awarded similar prizes? Any family historians whose ancestor won a prize similar to this? How might it be decided whether someone was worthy of a prize in it? Answers on the back of a duster, mayhap. The pinafore – or pinbefore as it was often known by past pupils; a dialectal variation – is a sleeveless garment open at the back and worn over other clothing to protect it. According to the dictionary, the first recorded use of the word was in 1782 and the name derives from pin and afore, denoting an apron with a bib which was pinned onto the front of a dress. 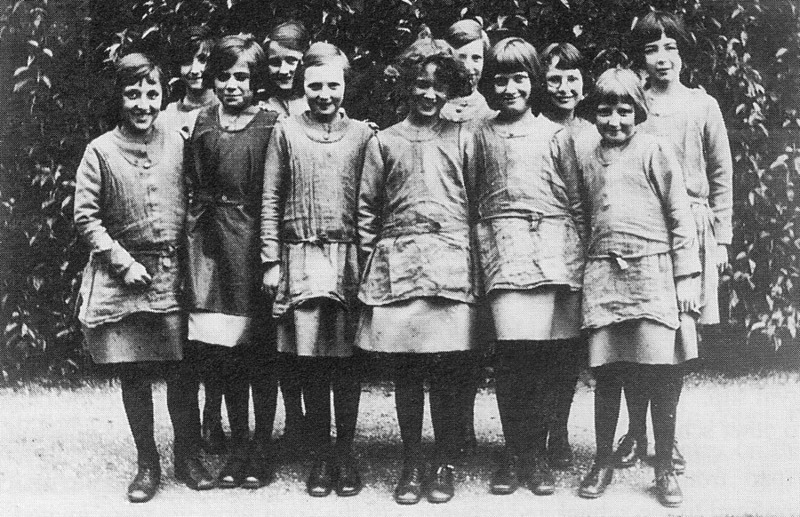 A pinafore was part of school dress at the Masonic school from its inception, continued throughout the whole of the following century and still featured in the 1930s. The first is dated to c.1800, the second c.1845 and the last from 1875. This is certainly an interesting variation of a pin afore! 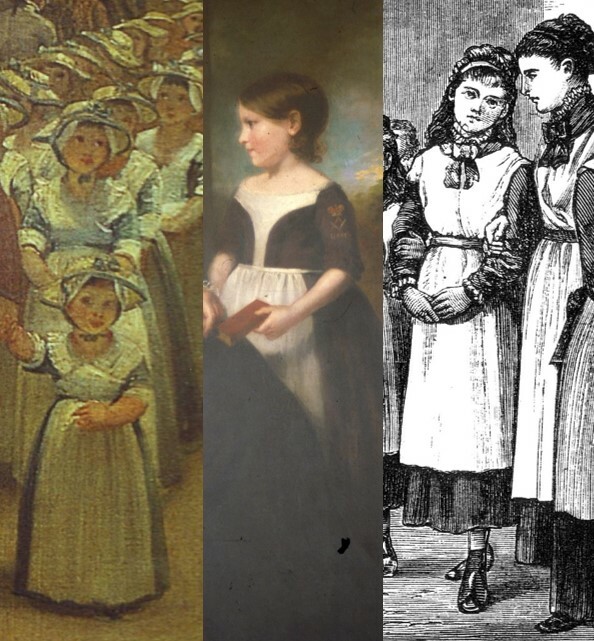 Throughout the nineteenth century, the pinafore is in evidence as a part of the uniform although by the beginning of the twentieth century it had changed from being white for everyday wear to being made of brown holland. This was an unbleached linen originally made in the Netherlands, hence its name. It was more like sacking than the quintessential image of a Victorian girl as represented by Tenniel in his depiction of Lewis Carroll’s Alice. The white pinafore was reserved for best dress occasions. This image shows the pinafore worn by younger pupils. Undated but believed to be from the 1920s, it depicts the pinafore as very much a working garment. When the School moved to its latest site in 1934, the pinafore was still visible. This image cannot be earlier than 1934 and is probably 1937, and it shows the pinafore still in use. However, by this stage, it was a garment worn in the same sort of way as aprons are worn today – a protection for clothes. But, it was not quite the end of the ‘pinbefore’! In 2009, the School celebrated 75 years on its current site with a 1934 day. 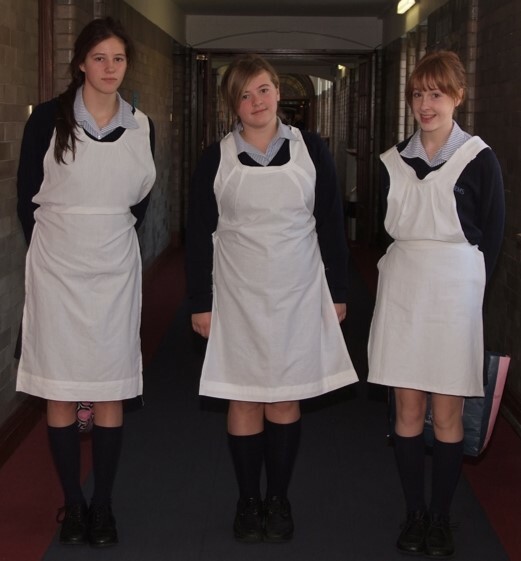 Obviously it was too much to ask for everyone to invest, for one day, in genuine 1930s outfits so the compromise was that the modern pupils would be asked to create an apron in the style of the old uniform and wear that over their usual uniform. (It was at this point that it was discovered that many mummies no longer sewed as there were countless cris de coeur over the summer holidays for help in constructing this garment!) The modern pupils had a thoroughly enjoyable day sampling 1934 style lessons and wearing their pinafores just as their predecessors had done since 1788.